Cognizant Interactive offers a boutique style agency experience on a global scale, with solutions grounded in human insights. Cognizant Interactive is part of Cognizant, one of the world’s leading professional services companies, and award-winning Adobe partner. The company was also recognized by AdAge as the #1 digital agency network in the US and #3 in the world last year. After visiting their inspirational booth at the Summit, I felt compelled to find out more about the road ahead. Donna Tuths, SVP and Global Head of Cognizant Interactive joins me at the Adobe Summit to share her vision and perspectives on delivering world-class experiences. 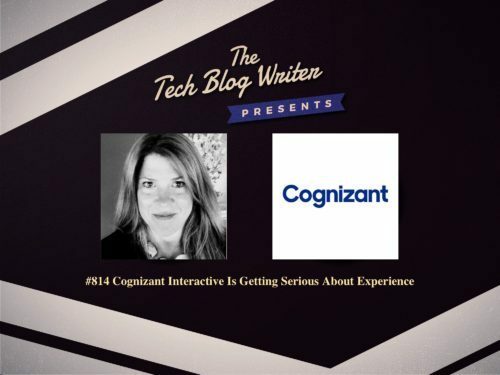 Donna leads the Cognizant Interactive team in powering the content lifecycle from concept to commerce, bringing experiences to life for clients across industries. Over the past decade, Donna has disrupted the agency landscape by combining the capabilities of a traditional agency, with those of business, digital and technology consultancies. She has also expanded Cognizant Interactive offerings through a number of successful acquisitions. On today’s daily tech podcast, we discuss what the future holds for the digital/interactive space, what marketing and digital executives should consider in planning for the next 5 years, and what does it mean to be a modern marketer. We also discuss how original, authentic, and human-inspired content is important for companies and why mastering video content is essential in the social world. If you or your business wants to know more about what to consider when making a digital/interactive investment and selecting partner – the agency profile of the future, you will find today’s conversation invaluable.